Gamal et al. (IEEE Trans. Inform. Theory 52:2568–2592, 2006) showed that the end-to-end delay is n times the end-to-end throughput under centralized time division multiple access scheduling. In our other work (IEEE Trans. Mobile Computing, in press), it was proved that the relationship between the end-to-end throughput and the end-to-end delay of Gamal et al. still holds under the IEEE 802.11 distributed coordination function (DCF) when the carrier sensing range and the packet generation rate are jointly optimized. The main purpose of this study is to determine whether the result in our other work is achievable when the transmission range is adjusted instead of the carrier sensing range. To this end, we revise the transport capacity by reflecting a queue at each node and optimize the revised transport capacity by jointly controlling the transmission distance and the packet generation rate. Under our system model, it is shown that the end-to-end throughput and the end-to-end delay scale are Θ 1 / n log n and Θ n / log n , respectively, where n is the number of nodes in the network. That is to say, the result that the end-to-end delay is n times the end-to-end throughput under the DCF mode is also estabilished while jointly optimizing the transmission range and packet generation rate. Wireless multihop networks (WMNs) have received considerable attention because of their ability to enhance the spectrum and energy efficiency. To exploit such advantages, researchers have attempted to use various approaches at all levels of communication protocols. The key performance metric in a WMN is the end-to-end throughput, referring to the number of packets that can be transported successfully from a given source to its destination. As the node density increases, each node transmits packets to its nearest node. In the seminal work in this area , Gupta and Kumar proved that the maximum end-to-end throughput scales as Θ 1 / n log n a , where n is the number of nodes in the network. The end-to-end delay, i.e., how fast a packet is transported from a given source to its destination, depends on the end-to-end throughput. Because a node delivers its packet to the nearest node, the number of hops to the destination increases. Thus, more transmissions are needed to transport one packet from a source to the destination. In , Gamal et al. showed that the end-to-end delay is n times the end-to-end throughput under centralized time division multiple access (TDMA) scheduling. In our other work , we proved that the relationship between the end-to-end throughput and the end-to-end delay  still holds when the IEEE 802.11 distributed coordination function (DCF), a representative practical medium access control (MAC), is utilized. We defined the delay-constrained capacity as the maximum end-to-end throughput satisfying the end-to-end delay requirement. Given the end-to-end delay requirement, we maximized the delay-constrained capacity by jointly controlling the carrier sensing range and the packet generation rate and proved that the delay-constrained capacity is the end-to-end delay requirement divided by n.
When multiple IEEE 802.11 networks coexist, controlling the transmission range is more secure than controlling the carrier sensing range. Tuning the carrier sensing range of one network may significantly degrade the performance of the other networks . Provided that the carrier sensing range of one network decreases, the nodes in the network have more chances to access the wireless medium whereas the nodes in the other networks do not have. These nodes receive excessive interference because the distance to the nearest interfering node becomes shorter than they estimated. On the other hand, adjusting the transmission range of one network does not increase the interference temperature significantly because the carrier sensing range, which determines the transmission opportunity, is not changed. The objective of our study is to determine whether the relationship between the end-to-end throughput and the corresponding end-to-end delay  is established when the transmission range is adjusted instead of the carrier sensing range. When controlling the transmission range, two different phenomena occur. As the transmission range increases, the number of transmissions to deliver one packet from a given source to its destination is reduced. On the other hand, the quality of each wireless link deteriorates. These phenomena can be explained by the transport capacity, which is defined as the product of the transmission rate and the transmission distance . The original definition of the transport capacity does not contain the queuing delay at each node, which is a key factor to determine the performance of the WMN when the IEEE 802.11 DCF is used as a MAC protocol. We revise the transport capacity by incorporating a queuing delay at each node. This is referred to as the revised transport capacity throughout this paper. In , the authors defined the random access transport capacity to analyze the end-to-end throughput and the end-to-end delay of a WMN. However, the authors did not take into account the queue of each node. In this paper, we start with maximizing the revised transport capacity of the WCM, where the IEEE 802.11 DCF MAC protocol is adopted. One way to increase the revised transport capacity is to minimize the number of hops by increasing the transmission distance. However, with a long transmission distance, the waiting time at the queue of each node will grow. When the transmission distance increases, fewer bits are transported to ensure reliable reception and more bits remain in the queue. Such a queuing delay affects the revised transport capacity as perceived by the receiver node. Reflecting such aspects, we optimize the revised transport capacity by jointly controlling the transmission distance and the packet generation rate. As a result, it is shown that under the IEEE 802.11 DCF, the end-to-end throughput and the end-to-end delay scale are Θ 1 / n log n and Θ n / log n , respectively. This indicates that adjusting the transmission range and choosing the proper packet generation rate can establish the tradeoff relationship between the end-to-end throughput and the end-to-end delay . The rest of this paper is organized as follows: In Section 2, we summarize related works. In Section 3, our system model is described. In Section 4, we introduce the revised transport capacity and optimize it with respect to the transmission range and the packet generation rate. In Section 5, we derive the scaling laws of the throughput and the end-to-end delay. Finally, we conclude the paper in Section 6. In a random network, it is a critical problem as to how the end-to-end throughput and the end-to-end delay scale with the number of nodes, n. In , the authors showed that the end-to-end throughput scales as Θ 1 / n or Θ 1 / n log n , depending on whether the network is arbitrary or random. The end-to-end throughput gap between an arbitrary and a random network is caused by the network connectivity characteristics. In a random network, there is the additional cost of tuning the transmission range, which degrades the performance on the order of log n as compared with an arbitrary network. When the end-to-end throughput is Θ 1 / n log n , the corresponding end-to-end delay becomes Θ n / log n . On the other hand, a different study  derived the end-to-end throughput of Θ ( 1 / n ) in a random network using what is known as percolation theory. Supporting node mobility can improve the end-to-end throughput. In , it was claimed that when all nodes move around the network, the end-to-end throughput becomes independent of n, as described by the scaling law Θ(1). The mobile nodes communicate with each other only when they are very close. It was assumed that each node uniformly moves over the entire network area. In , the authors analyzed the end-to-end throughput scaling laws under various mobility models. Scaling laws in [7, 8] are derived under a loose delay constraint, in which the speed of mobile movement is significantly slower than the delay requirement. In [2, 9–11], the authors explained the tradeoff relationship between the end-to-end throughput and the end-to-end delay of mobile networks. In , it was proved that the average delay scales with Θ(n), for both the stationary and mobile nodes. Seol and Kim [13, 14] claimed that controlling the mobility can decrease the end-to-end delay while maintaining the constant throughput scaling law. Most previous works [1, 2, 6–14] tend to simplify the MAC influencing the end-to-end throughput and the end-to-end delay. Some studies have attempted to verify the performance of a WMN when a practice MAC is utilized. Hwang and Kim  found that the result  is a reasonable throughput estimation for networks with ALOHA-like MAC. In [16, 17], it was proved that IEEE 802.11 DCF cannot achieve the Θ 1 / n log n end-to-end throughput because of the randomness of the DCF. In , we jointly optimized the carrier sensing range and the packet generation rate and showed that the tradeoff relationship between the end-to-end throughput and the end-to-end delay occurs in spite of utilizing the DCF mode. where θ (>2) denotes the path loss exponent. We neglect fast fading and only consider the path loss here. 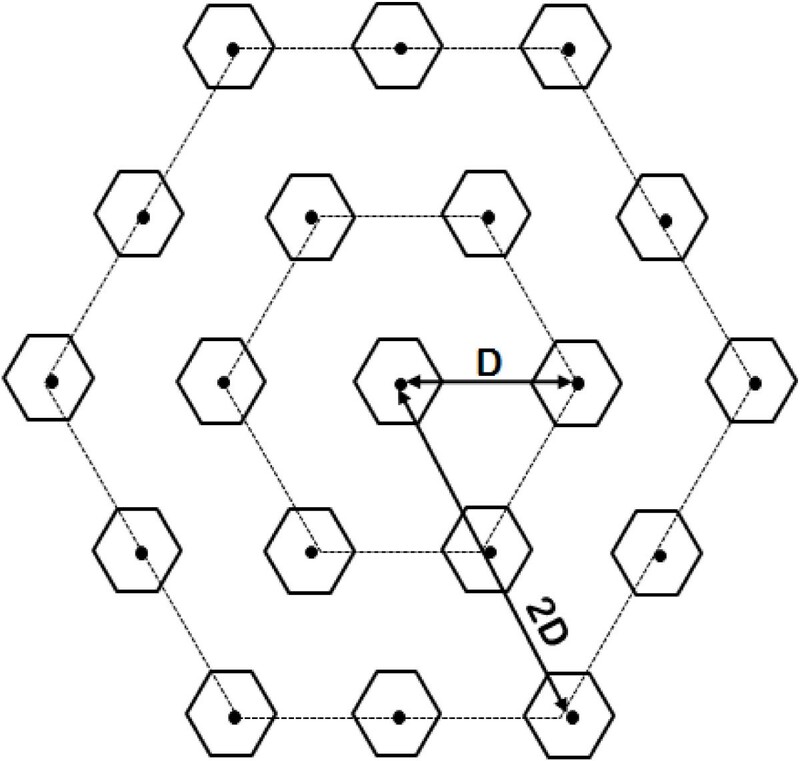 All the mathematical notations are summarized in Table 1.
γ i , j ( R , D ) = γ i , j honey grid ( R , D ) = R − θ 6 ( D ) − θ + 12 ( 2 D ) − θ + 18 ( 3 D ) − θ + ⋯ = D R θ 6 ζ θ − 1 . Interference model under physical carrier sensing with D .
C ( R , D ) = log 2 1 + γ i , j ( R , D ) = log 2 1 + D R θ 6 ζ θ − 1 .
where M denotes the unit packet size (in bits), and the function ⌊x⌋ indicates the largest integer not greater than x. It is understood that log 2 1 + D R θ 6 ζ θ − 1 / M packets are certainly delivered by a single transmission. As the transmission range R increases, m(R,D) decreases. There is a tradeoff between how many packets are transmitted and how far the packets are transported. λ = Λ + Λ ( E [ H ] − 1 ) = ΛE [ H ] . λ = ΛE [ H ] = Λ L R .
T = 1 ξ + T t 1 − nπ D 2 λ T t .
1 μ = T m ( R , D ) = M · T log 2 ( 1 + γ i , j ( R , D ) ) . E [ d q ] = 1 μ − λ = log 2 ( 1 + γ i , j ( R , D ) ) M · T − Λ · L R − 1 . The average queuing delay (E[d q ]) is dependent on the number of nodes (n), the sensing range (D), the transmission range (R), and the packet generation rate (λ). The average queuing delay E[d q ] is a key factor that is used to express the performance of the IEEE 802.11 DCF. In the following section, we will define some performance metrics in terms of E[d q ] and show how these metrics are affected by n, D, R, and λ.
v ( R , Λ ) = R E [ d q ] = R · log 2 ( 1 + γ i , j ( R ) ) M · T − Λ · L R .
d e ( R , Λ ) = L v ( R , Λ ) = L R E [ d q ] = E [ H ] E [ d q ] . (Feasible end-to-end throughput) The end-to-end throughput of λ packets per second for a node is feasible when the end-to-end delay is finite. Note that the packet generation rate λ is equivalent to the end-to-end throughput when its corresponding end-to-end delay is finite. In other words, the destination node can receive packets with rate λ.
Λ max ( R ) = sup Λ : d e ( R , Λ ) < ∞ = sup Λ : v ( R , Λ ) > 0 = sup Λ : R · log 2 ( 1 + γ i , j ( R ) ) M · T − Λ · L R > 0 .
v ( D / 2 , Λ ) = D 2 E d q = D 2 log 2 1 + 2 θ 6 ζ θ − 1 M · 1 ξ + T t 1 − nπ D 2 Λ L D / 2 T t − Λ L D / 2 = log 2 1 + 2 θ 6 ζ θ − 1 M · 1 ξ + T t D 2 − nπ D 2 ΛL T t − Λ · L = D · log 2 1 + 2 θ 6 ζ θ − 1 2 · M · 1 ξ + T t − log 2 1 + 2 θ 6 ζ θ − 1 nπ D 2 L T t M · 1 ξ + T t + L Λ.
Λ max ( D / 2 ) = D · log 2 1 + 1 6 ζ θ − 1 2 θ 2 log 2 1 + 1 6 ζ θ − 1 2 θ nπ D 2 L T t + LM 1 ξ + T t .
C T ( D / 2 , Λ ) = M · Λ · D · log 2 1 + 1 6 ζ θ − 1 2 θ 2 · M · 1 ξ + T t − log 2 1 + 1 6 ζ θ − 1 2 θ nπ D 2 L T t M · 1 ξ + T t + L Λ .
v ( D / 2 , Λ ∗ ( D / 2 ) ) = D · log 2 1 + 1 6 ζ θ − 1 2 θ 4 · M · 1 ξ + T t .
Our objective in this subsection is to determine the optimal transmission range and packet generation rate that maximize the revised transport capacity C T (R,Λ). We begin by finding the optimal transmission range R∗(Λ) that maximizes C T (R,Λ) (maximizing the packet velocity v) when λ is fixed. The number of nodes that have at least one packet to transmit ( n D 2 λ = n D 2 Λ L R ) depends on transmission range R, as given in (6). One way to decrease the transmission time T of (7) is to increase R and thus reduce the number of incoming packets λ (see also (6)). On the other hand, an excessive increase in the transmission range R may increase E[d q ] by reducing the number of packets, m(R,D), as noted in (4) and (9). A 2 = inf Λ > 0 : R ∗ ( Λ ) = D 2 = 2 θ · θ 6 ζ θ − 1 − ln 1 + 2 θ 6 ζ θ − 1 1 + 2 θ 6 ζ θ − 1 2 nπDL T t · 2 θ θ 6 ζ θ − 1 . The optimal transmission range R ∗ (Λ) as a function of packet generation rate λ .
Λ L R ∗ ( Λ ) < 1 nπ D 2 T t R ∗ ( Λ ) > Λnπ D 2 T t L.
As λ increases, the optimal transmission range R∗(Λ) should linearly increase to maintain the constraint (22). 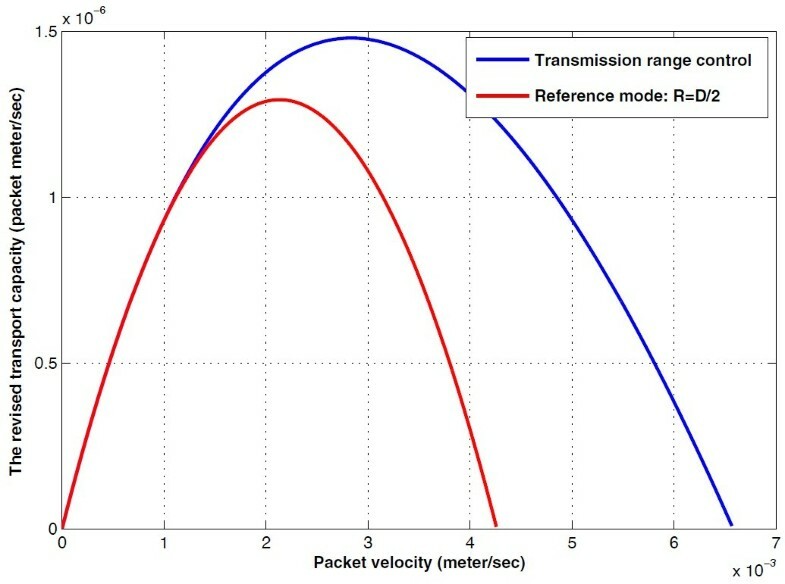 Figure 3 shows the relationship between the packet velocity v(R∗(Λ),Λ) and the packet generation rate (end-to-end throughput) λ when the optimal transmission range of Proposition 1 is utilized. These curves determine the boundaries of the packet velocity (i.e., the inverse of the end-to-end delay) and the end-to-end throughput. The points at which the packet velocity is zero correspond to the end-to-end throughput capacity Λmax(R∗(Λ)) of Definition 4. As the packet velocity increases, the end-to-end throughput decreases. An interesting feature is that Λmax(R∗(Λ)) increases as the path loss exponent increases. This is attributed to the fact that the interference from neighbors is filtered by the high path loss, as well as to the fact that the single-hop transmission rate increases. The end-to-end throughput as a function of the packet velocity v(R ∗ (Λ),Λ) . The path loss component θ is 3, 4, 5, or 6. In each point, the optimal transmission range of Proposition 1 is used. 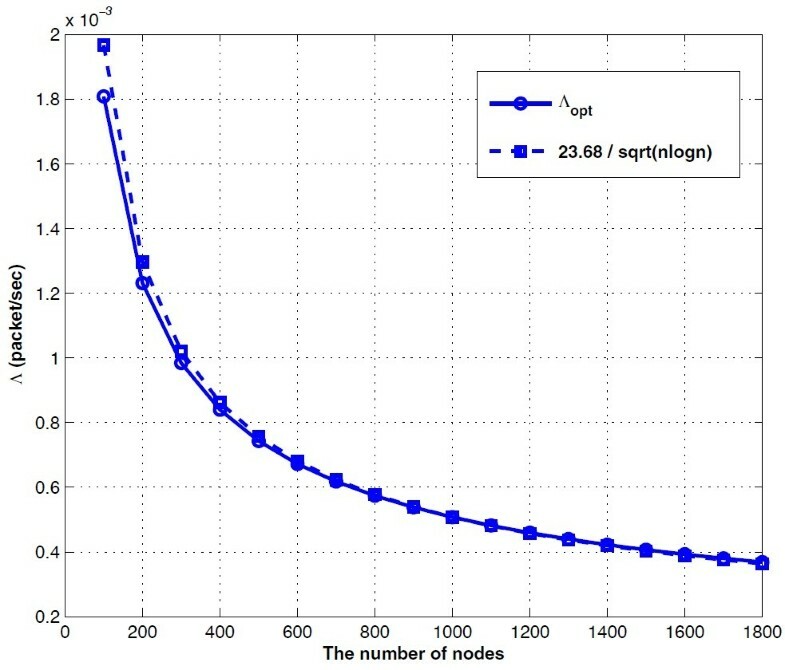 The number of nodes is 1,000 and the sensing range D is set to 2 log n n . The packet bit rate M is log 2 1 + 1 6 ζ θ − 1 2 θ .
Λ ≤ 2 θ θ 6 ζ θ − 1 − ln 1 + 2 θ 6 ζ θ − 1 1 + 2 θ 6 ζ θ − 1 2 nπDL T t · 2 θ θ 6 ζ θ − 1 . The revised transport capacity C T (R ∗ (Λ),Λ) as a function of the packet velocity v(R ∗ (Λ),Λ) . The path loss component θ is 4. In each point, the optimal transmission range of Proposition 1 is used. The number of nodes is 1,000 and the sensing range D is set to 2 log n n .
and c is an arbitrary constant value. 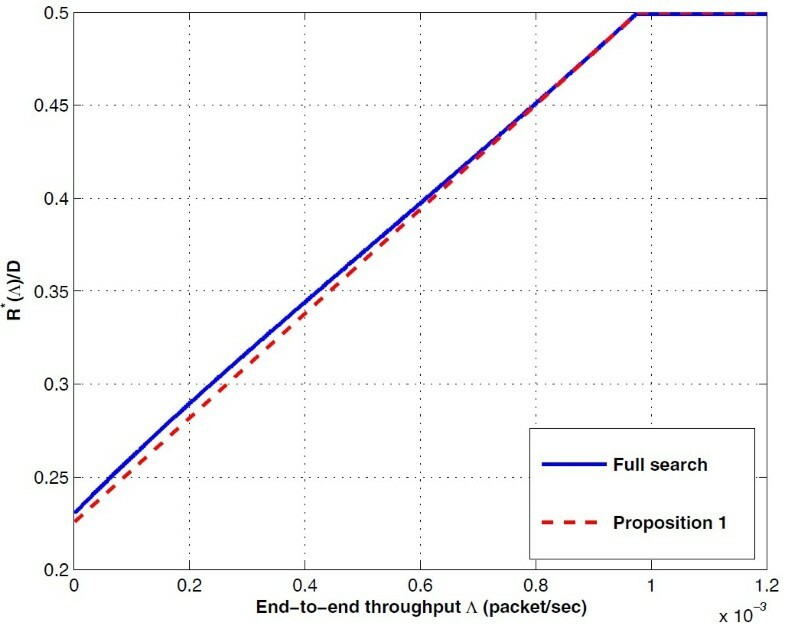 Figure 5 shows the relationship between the end-to-end throughput, the packet velocity, and the revised transport capacity. The solid and dotted lines represent cases in which the optimal transmission range R∗(Λ) is used and where the transmission range R is fixed at D/2, respectively. A higher end-to-end throughput consequently makes the packet velocity slower. The regions under the curves denote the set of feasible end-to-end throughput for both cases. When the packet velocity is low, there is no gap between the two regions. This is explained by the fact that the optimal transmission range R∗(Λ) is D/2 when the end-to-end throughput λ is high (see Figure 5). As the packet velocity increases, on the other hand, the gap becomes larger. We conclude that there is end-to-end throughput enhancement caused by the optimally controlled transmission range R∗(Λ) (Proposition 1) as the packet velocity becomes faster, and the end-to-end delay becomes shorter. 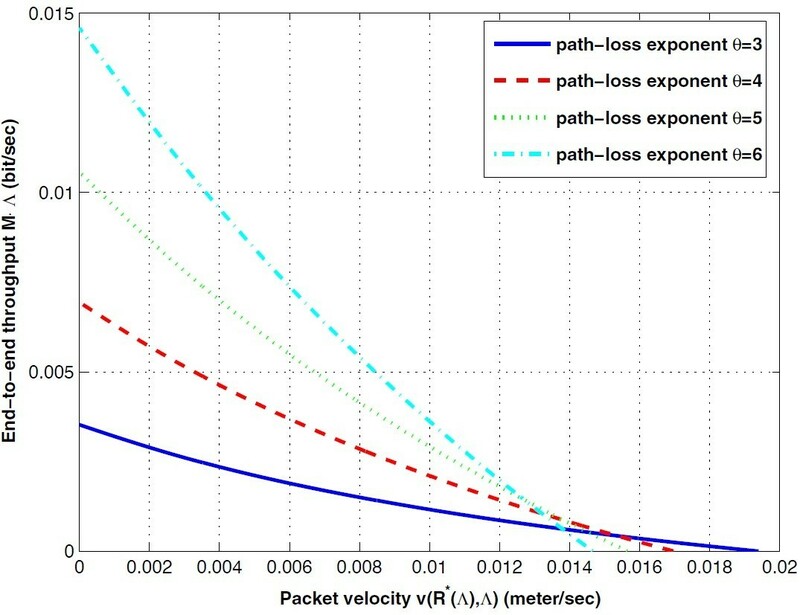 The end-to-end throughput (packet generation rate) Λ as a function of the packet velocity. The path loss component θ is 4. In each point, the optimal transmission range of Proposition 1 is used. The solid and dotted line represent the cases when the optimal transmission range R∗(Λ) is used and the transmission range R is fixed to D/2, respectively. The number of nodes is 1,000 and the sensing range D is set to 2 log n n .
G v = x ′ x , G Λ = y ′ y . The total gain G of point (v(R∗(Λopt),Λopt),Λopt) is always higher than any reference coordinate in the feasible region. In the case of a WMN, we expect that the end-to-end throughput decreases and that the end-to-end delay increases as the node density increases. An important problem is how to quantify these relationships. v ( R ∗ ( Λ opt ) , Λ opt ) = Θ log n n .
v ( D / 2 , Λ ∗ ( D / 2 ) ) = log n n · log 2 1 + 2 θ 6 ζ θ − 1 4 · M · 1 ξ + T t = Θ log n n .
Note that when the transmission range is fixed to D/2, the scaling law of the end-to-end throughput (30) is lower than the results in . This occurs as a result of the difference between centralized TDMA scheduling and distributed MAC (IEEE 802.11 DCF). However, controlling the transmission range and the packet generation rate fully compensates for the gap between the two. Figures 6 and 7 prove that Proposition 3 is well matched. The optimal end-to-end throughput (packet generation rate) Λ opt as a function of number of nodes ( n ). The path loss component θ is 4. 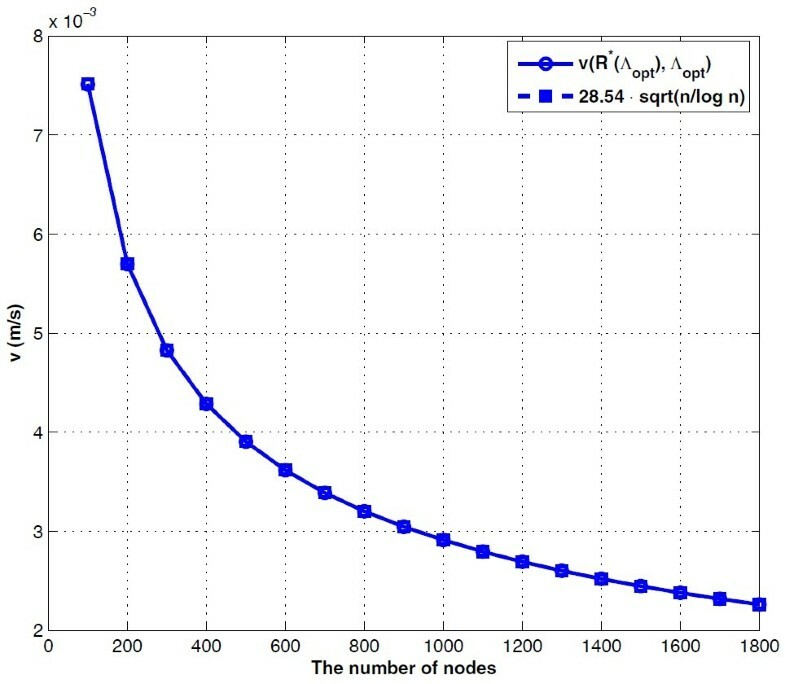 The sensing range D is set to 2 log n n .
The packet velocity with the optimal end-to-end throughput (packet generation rate) v(R ∗ (Λ opt ),Λ opt ) . The path loss component θ is 4. The sensing range D is set to 2 log n n .
In , Gamal et al. proved that the end-to-end delay is n times the end-to-end throughput by controlling the carrier sensing range and the packet generation rate under centralized TDMA scheduling. In this paper, we verified whether IEEE 802.11 DCF can establish this tradeoff relationship by jointly controlling the transmission range and the packet generation rate. To this end, we redefined the transport capacity in  by considering the average queuing time at each node. There are interdependencies among the transmission range, the maximum data rate by a single-hop transmission, and the average waiting time in the node queue. Increasing the transmission range plays a key role in decreasing the hop count, which in turn shortens the packet delay. On the other hand, increasing the transmission range reduces the number of packets that can be transmitted by a single-hop transmission, which therefore increases the average packet waiting time. Therefore, there exists an optimal transmission range suitable to minimizing the end-to-end delay. In this study, we analyzed the optimal revised transport capacity by controlling the transmission range and by choosing the appropriate packet generating rate. Finally, it is proved that the scaling laws of the end-to-end throughput and end-to-end delay are Θ 1 / n log n and Θ n / log n , respectively, which are equivalent to the results in . Note that when the transmission range is fixed, the scaling law of the end-to-end throughput is o 1 / n log n . This means that the performance degradation by using IEEE 802.11 DCF instead of centralized TDMA scheduling is mitigated by adjusting the transmission range and the corresponding packet generating rate. f(n)=Θ(g(n)) ⇒ ∃ c1, c2, n0>0 s.t. c1g(n)≤f(n)≤c2g(n), ∀n≥n0. f(n)=O(g(n)) ⇒ ∃c, n0>0 s.t. 0≤f(n)≤c g(n), ∀n≥n0. f(n)=O(g(n)) ⇒ ∃c, n0>0 s.t. 0≤f(n)<c g(n), ∀n≥n0. 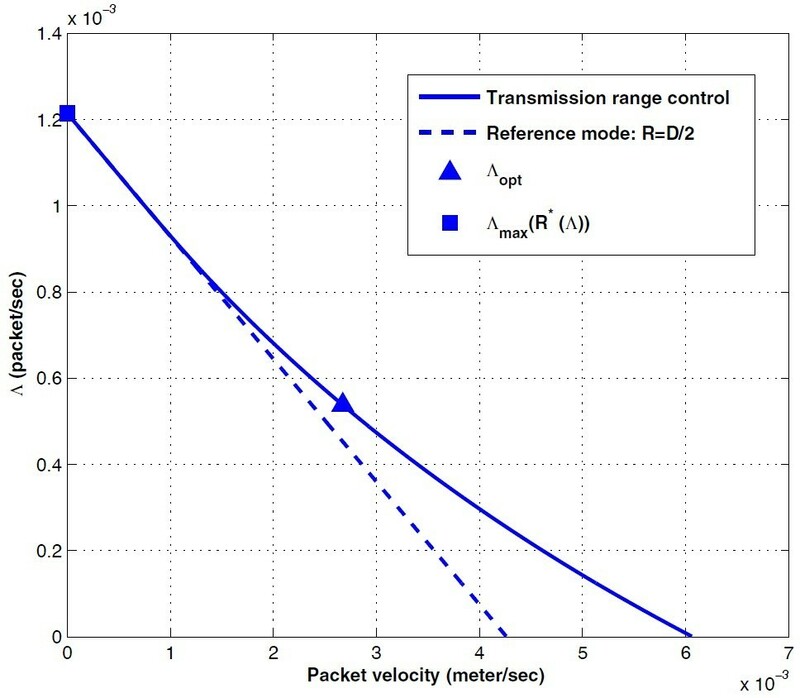 bThe transmission range (R) should be less than D/2 to avoid the hidden node problem . cThe back-off timer stops if any node in the sensing range is transmitting. d D cannot shrink faster than log n n to maintain the connectivity of the nodes . v ( Λ , R ) = R · log 2 1 + 1 6 ζ θ − 1 D R θ M 1 ξ + T t 1 − nπ D 2 Λ L R T t − ΛL = log 2 1 + 1 6 ζ θ − 1 D R θ M 1 ξ + T t ( R − nπ D 2 ΛL T t ) − ΛL. ∂ ∂R v ( Λ , R ) ≡ ∂ ∂R log 2 1 + 1 6 ζ θ − 1 D R θ ( R − nπ D 2 ΛL T t ) = − 1 6 ζ θ − 1 D R θ · θ · ( R − nπ D 2 ΛL T t ) R · 1 + 1 6 ζ θ − 1 D R θ + log 2 1 + 1 6 ζ θ − 1 D R θ ln 2 = 0 . R = D · 1 6 ζ θ − 1 ( exp ( θ ) − 1 ) 1 / θ ≡ A 1 . Λ = 2 θ · θ 6 ζ θ − 1 − ln 1 + 2 θ 6 ζ θ − 1 1 + 2 θ 6 ζ θ − 1 2 nπDL T t · 2 θ θ 6 ζ θ − 1 ≡ A 2 .
which is equivalent to the result of Proposition 1. C T ( R ∗ ( Λ ) , Λ ) = Λ m ( R ∗ ( Λ ) , D ) 1 ξ + T t R ∗ ( Λ ) − nπ D 2 ΛL T t − ΛL = Λ m ( R ∗ ( Λ ) , D ) ( 1 ξ + T t ) D / 2 − a b Λ + a − nπ D 2 ΛL T t − ΛL . m ( R ∗ ( ˆ Λ ) , D ) = log 2 1 + 2 θ 6 ζ θ − 1 M − θ ln 2 M b Λ + θ ln 2 M + c.
which is a quadratic equation. The solution of Equation 39 is identical to the result of Proposition 2. Network connectivity is a critical problem in a WMN because nodes are randomly distributed. In our system model, sensing range D is a critical parameter in the determination of the network connectivity. Let us define D c (n) as the sensing range that guarantees network connectivity. We use D c (n) instead of D.
A 1 = Θ D c ( n ) A 2 = Θ 1 n D c ( n ) B 1 = Θ ( 1 ) B 2 = Θ ( 1 ) B 3 = Θ n D c ( n ) . R ∗ ( Λ opt ) = Θ ( n D c ( n ) 2 Λ opt + D c ( n ) ) = Θ ( D c ( n ) ) v ( R ∗ ( Λ opt ) , Λ opt ) = m ( R ∗ ( Λ opt ) , D c ( n ) ) 1 ξ + T t R ∗ ( Λ opt ) − nπ D c ( n ) 2 Λ opt L T t − Λ opt L = m ( R ∗ ( Λ opt ) , D c ( n ) ) 1 ξ + T t · R ∗ ( Λ opt ) − Λ opt L nπ D c ( n ) 2 T t m ( R ∗ ( Λ opt ) , D c ( n ) ) 1 ξ + T t + 1 = Θ ( 1 ) · Θ ( D c ( n ) ) − Θ 1 n D c ( n ) · Θ n D c ( n ) 2 = Θ ( D c ( n ) ) . Because D c (n) cannot shrink faster than log n n to maintain the connectivity of the nodes , (40) and (41) are reduced to Proposition 3. This research was supported by the International Research & Development Program of the National Research Foundation of Korea (NRF) funded by the Ministry of Education, Science and Technology (MEST) of Korea (grant number: 2012K1A3A1A26034281, FY 2012).